My summer consisted of getting acquainted with pyramids: Teotihuacán, Monte Albán, and Cholula in Mexico in June, and the ACTFL proficiency pyramid at an Oral Proficiency Interview (OPI) workshop in August. Want to know more about the Mexican pyramids? Google them and visit them. Want to know more about OPI? Don’t Google that, because you will get all sorts of results about some kind of make-up and pedicure technique that I have no expertise in. You need to read all about it on ACTFL’s website or go to an OPI workshop yourself – and let me tell you why you should do so in my post below. Table of contents. Pick and choose what catches your attention. The first two are the meat of the post, #3 will interest heritage teachers, and I’d love to hear answers regarding #4. The biggest takeaway I got from the OPI workshop is being able to place virtually any linguistic task along the proficiency scale. What can a novice do, and how well can they do it? I can tell you. What proficiency level is required to tell a story about how you got lost in a city and found your way back? That’s Advanced. What level is required to give a string of sentences to generally describe your city? That’s Intermediate level. How about making a list of favorite foods? That would be a Novice task. Debating the consequences of dismantling Confederate statues? Superior. I feel very empowered now to look at my own curriculum and that of my colleagues and determine whether or not the tasks and functions we are expecting of students at different levels are realistic, or if they are sailing too high. All of the above, with the exception of the last one, would be Advanced level tasks – if performed spontaneously. The last one would qualify as Superior or Distinguished (yikes), namely a well-educated native speaker that can adjust register for formal and informal situations. But notice that I’m saying “spontaneously”. See my “Lingering question” section about this down below. I have now seen the light, for the most part, about why textbook series often get it wrong when it comes to laying out units and curriculum. I am starting to see that a scope and sequence should progressively follow functions and contexts more than grammar structures. And then what does that same curricular planner do? 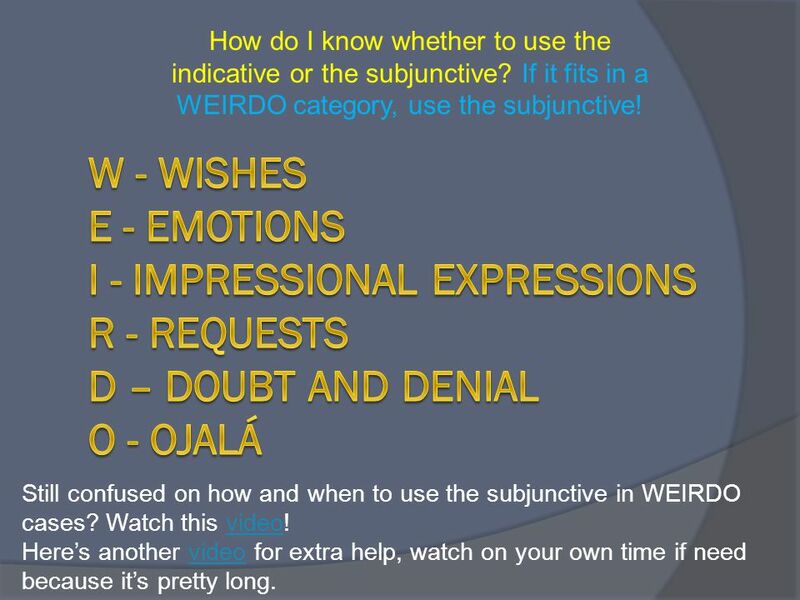 WEIRDO acronym (this here), and accompanying tasks to teach all contexts of usage for subjunctive. When you teach subjunctive, you have to teach all the contexts in which it is used, right? So then the planning process goes on to look for other ways within that unit, and subsequent units, that requests, impersonal expressions, doubt, and ojalá can all have a seat at the table. The point is, less is more. Think in terms of what is needed for effective, comprehensible communication. The time that we don’t spend teaching the entire universe of all past, present, future, and progressive perfect tenses and aspects we can spend talking and communicating with our classmates and the teacher. What does the assessment front look like in the classroom with an understanding of proficiency? One thing that I have included in my rubrics now for awhile (hopefully most folks do-?) that was reaffirmed through OPI was “comprehensibility despite errors” in my “Language use” section of my rubrics. I do also have target grammar structures for the unit included in the “Language Use” section, and I think that for now I will keep it there, but I want to sleep on that more. One thing that came to the forefront in reading my OPI materials later is that language learners can be at different proficiency levels for different modes of communication. Where are students generally weakest? Speaking. Students tend to be so freaked out about speaking assessments for this reason, and so what do most language teachers do? Give the questions ahead of time, have them practice them, allow them to use notes, etc. But deep down, we really want to assess for that more spontaneous communicative event. That’s what I understand the “movement towards proficiency” to be about – right? So how about we adjust the requirements of the speaking task down, but keep higher standards for other skills? As an example, for a unit about describing your city in a Novice/Novice-Mid level class, perhaps a speaking assessment could include a prompt like “What kinds of places do you visit in your city every week?” and would only require students to name off and list places for successful completion – no grammatical accuracy requirements attached, just comprehensibility. However, a written task could be “Talk about what places there are in our city to your online pen pal” and require students to use some short sentences, and partially use gender agreement accurately. Something along those lines. If you are a religious TPRS fundamentalist who was hoping to read this post to discover that a fellow language teacher left OPI training convinced of the need to throw grammar out the window, sorry. ACTFL posits that grammatical knowledge runs on a scale that starts with conceptual understanding, then moves to partial control, and then ends up at complete control. Lots of failed attempts to use ‘went’. Lots of “I goed” I went to the store yesterday. My mother goed last week. I went to the store yesterday. My mother went last week. OPI training does not discuss how that understanding gets into your brain in the first place, other than saying that conceptual knowledge starts the process of grammatical control, but it does seem to advocate for the value of explicit knowledge. You move along this continuum as you move up the proficiency pyramid. What is proposed is that we assess for those degrees of control for certain language functions at certain proficiency levels that we deem our students should be at. Better to show than to tell. See below for a small sample. I finished OPI training a month ago and am already three weeks into my school year. I haven’t had the time yet to wrap my brain around how to shift my world of assessment around based on this new understanding of conceptual–>partial–>full, but there are some powerful principles there to unpack and apply eventually. It does seem to dovetail with some reflections I expressed in February about the explicit grammatical teaching in this post here, and so now I have more good guidance to work with. This new ability to be able to identify the proficiency level of given tasks will enable me to be a much more effective teacher of my heritage language classes (Spanish for Native Speakers, I & II). I feel that for the last five years, I have attempted to do a few things without having much of an eye for the proficiency level my students find themselves at. My goal is for students to preserve and improve their Spanish through reading and discussion, but I haven’t had a measured approach to determine how advanced the readings or discussion topics are. I can now. I have been having them interact with authentic news, magazine articles, poetry, and short novels, revolving around topics that I think will interest them or that I think they need. However, I haven’t been intentional enough about what proficiency level that content presumes, and as a result, some of our discussions have been over or under their level. And measuring improvement, for heritage speakers? I feel it’s been impossible. Not anymore! I will now be able to do two important things that good heritage language teachers should be able to do: accurately assess what type of proficiency level my students are at, and then define what things they will need to do in order to reach the next level. During the OPI workshop, I was thinking about a lot of my heritage class students – and I came to the stark realization that they are all over the board. I mean, I have sort of known that, but now I know it with much more specificity. They are more scattered along the proficiency spectrum than my general language classes. I am no longer concerned about it though. I no longer need to vaguely know that “Jose speaks Spanish more fluently than Guillermo”. I will now be able to determine that “Jose’s level of Spanish is Advanced-Low, but Guillermo’s is Intermediate-Mid, and so he cannot narrate in all time frames and describe things in paragraph format – all of which Guillermo can do. Guillermo will need to work on describing things and telling stories, but José needs to be pushed towards perfecting his usage of preterit and imperfect, and then work on answering higher-order prompts that challenge him to think of our topics in the abstract and apply them to society at large.” Something like that. Here is a post which shows how I am already planning to implement some major differentiation in my heritage classroom this year (spoiler alert: major differentiated instruction / individual goal setting). I haven’t gotten to this element yet in the school year. However, when I showed the idea to my SNS 2 students who sat under me for SNS 1 last year and know what it’s like for all 25 of them to examine the same grammar topics at the same time, it got some cheers. I am now in a bit of a quagmire about teaching for and assessing for proficiency – by that definition. In theory, for students to demonstrate their proficiency to me, I should not be informing them ahead of time of what I’m going to “ask” them. Perhaps the answer is that within the context of a given unit, if there have been clear topics that have been focused on, and students have performed communicative tasks with those topics, then any production prompt given to them – whether written or spoken – would not be a surprise. But still, most teachers, including myself, feel inclined to give students some lead on what and how they will be assessed – and students in turn feel compelled to go prepare. But if we are focused on communication in the classroom, they would be prepared. Am I answering my own question? I signed up for Full OPI certification a couple weeks ago. I should be hearing from OPI any day now about further steps. In the mean time, I have listened to all sorts of sample OPI’s on their training site, and have done three practice interviews just for the heck of it – and even that has had a positive effect on my proficiency understandings as a teacher (oh, this is what Intermediate-Low speakers sound like). But 2200+ words is enough for now, so I’ll have to save that for a later post. Make sure to fit an OPI workshop into your professional development at some point as a language teacher. I was able to pay for the $850 workshop and the $350 certification fee through a grant from FundforTeachers. But before you attend the workshop, get your nails done using the OPI ProSpa Pedicure Massage technique. Over my last five years as a heritage language teacher, I have found that explicit grammar instruction has very little effect on my students. There are several reasons for this. One is that my heritage students are at a lot of different levels with their grammatical accuracy. Some students make no errors with gender agreement, verb forms, or object pronouns. Others have a high degree of fluency and can communicate about a lot of general topics with a good amount of vocabulary, but are at more of an Intermediate level with their grammatical accuracy – they produce a lot of language, but they fumble a lot with agreement and form, although they communicate most general ideas well. I want to abandon my class-wide grammar syllabus and start giving students what they need. Another reason that grammar teaching is difficult with heritage students is that they have a grammatical system in place already. Changing and altering it is tricky. They are dissimilar to our general language students in that they do not have grammatical systems under construction. They have a structure there, but the quality and completeness of that construction vary quite a bit. Many of them have developed strategies to compensate for their linguistic gaps and are comfortable with them. I strongly believe, however, that our heritage classrooms can be a good place to alter, remodel, add to their current abilities, and increase their monitor to help them notice gaps in accuracy in their speech and writing. But how do we do this? Most teacher blog posts I find on the blogosphere contain practices and successful lessons that teachers are implementing in their classrooms. I would like to use my post here to gather feedback for an idea I have to improve my teaching and then dialogue about it through the comment section below. When school starts again, I would like to try creating individual learning plans for my heritage students with regards to their grammatical development. The ideas I am fleshing out below were originally triggered on the Spanish for Heritage Learners group on ACTFL’s Special Interest Group page by a teacher named Sheryl Castro. I’m taking a great deal of what she suggested and am developing it into a version that I can start working into the classroom. Please share your thoughts in the comment section below and tell me if I am insane, or if this would be feasible. Evaluating individual grammar needs. Towards the beginning of the year, but even as the year progresses, I would start to monitor students’ written and spoken work, and make notes about what each individual student needs to develop. Establish individual goals. From there, each student is given things to focus on. For some students, it might be gender agreement, for another group it might be preterit / imperfect. I would probably need and want to keep the level of the concepts in mind depending on which heritage course it is (SNS I or SNS II). Document goals, recommendations, and progress. Their focuses for development would be tracked on a spreadsheet. In this location, I would also provide electronic resources for them to consult in order to learn about that grammatical topic and then come back and correct their errors – all in the same place. Follow-up assessment: I’m a bit uncertain at this point how I would hold students accountable for improving in their particular areas in the rest of work for the course. Perhaps I would include in the “Accuracy / Grammar” part of their rubrics, “See individualized plan; make sure you have checked for accuracy with those points”. I need to ponder this a bit. This is the nascent model I am thinking of for what students would see. I’ve filled in a few examples to imagine what it would look like in progress. Pasos de seguimiento Read this lesson here, and do the “Basic quiz” & “mini-test”. Email me a screenshot of your score. Corrige los errores aquí, o demuestra una mejora. Incluye una explicación (en inglés si prefieres) Voy en el carro – because “carro” is masculine. Tengo una mesa, because “mesa” is feminine. Will this be too much for me to manage? Will students be able to understand explanations of more complex grammar topics through self-study / flipped classroom? How can I fit this into my school’s plan for each teacher to show measurable student growth through an August pre-assessment and December post-assessment of the same content? I talked with an administrator about the workload that this would entail. I said that one of my biggest fears is having to open 25 different Google docs every time I want to note something for a student to work on. She suggested making one Google spreadsheet for each class, with multiple tabs for each student – labeled with their ID number for student privacy. My administrator even thought that this would be an easy way for other classmates to be involved in the process of giving input to peers.Will this be too much for me to manage? One other advantage that I see to doing this is that this would take on a flipped classroom methodology in which students are examining concepts (grammar in this case) and learning them independently, thereby freeing up class time for communication and discussion, which should be the focus of any language classroom. It incorporates technology, points students to resources out there that will do much better at explaining grammar than I can anyway (I foresee myself recommending lots of Senor Jordan videos), and differentiates instruction. Have any other language teachers out there – particularly heritage teachers – attempted something similar? How has it gone when establishing individual grammar goals? I am eager to know if others are doing this sort of thing. Please talk about your experiences or offer comments in your comments below!